What do you need to do to make your home fire-safe? Have a fireplace screen to keep embers from escaping and possibly catching fire. Mainly common sense: shutting off appliances after you've used them, keeping flammable items away from furnaces and space heaters, and making smoke detectors and fire extinguishers a part of your home decor. From there, being prepared to act when a fire occurs and having the necessary detectors in good working order to give you warning will help you rest easier. These home fire safety tips will help ensure you're prepared. Because the toxic gases from a fire could keep you from waking up should a fire ignite while you're sleeping, maintaining working smoke detectors for every level of your home is essential for home fire safety. Install smoke detectors on the ceiling (smoke rises) in every bedroom and outside bedroom doors, at the top of stairways, and in any den or office in the basement. Test the devices monthly, and replace the batteries at least once a year. 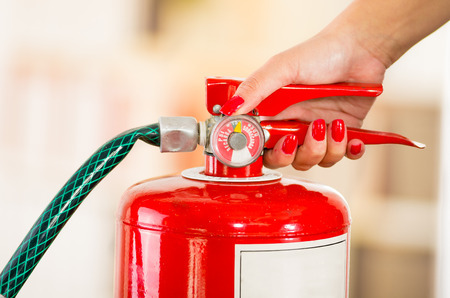 Fire extinguishers should also be kept on each floor as well as in every bedroom and in any room where a fire could occur, such as the kitchen or a workshop. Check fire extinguishers monthly - it could keep a small mishap from becoming a disaster. Check both the pressure gauge and the date tag. The best fire extinguisher is an easy-to-handle 2- or 5-pound (1 or 2.5kg) model designed to put out most household fires. If the pressure is low or the date is more than two years old, have the extinguisher serviced by licensed personnel recommended by the local fire department. Otherwise, as long as the pin is intact, you're ready to aim should the need arise. Another home fire safety must-have is a carbon-monoxide detector. This deadly, colorless, odorless gas is becoming a threat in more and more of today's energy efficient and airtight homes. The source of carbon monoxide is usually faulty burning in, or poor venting of, a furnace or another appliance. Your first defense is to maintain these items properly. Carbon monoxide detectors, which resemble smoke alarms, are an essential backup. Another simple safety precaution your family can take is to sleep with bedroom doors closed. Closed doors can keep smoke and fire from spreading into these rooms, potentially allowing you more time to escape. Install a fireplace screen, and have your fireplace chimney and flue cleaned at least once a year. Do not leave lighted candles unattended in bathrooms or anywhere little hands might reach. Fireplace candles or lighters go atop the mantel, not alongside the firewood, in easy reach. Maintain the kitchen stove in good working condition, and keep baking soda on hand to extinguish stove-top fires. In the garage, disconnect electrical tools and appliances when you're finished using them. Secure important papers in water- and fireproof strongboxes. Better yet: Put them in a safe deposit box off-site. Consider purchasing escape ladders for top story bedrooms to ensure family members have a means of escape should a fire break out. And most important, practice fire drills with your family so everyone knows what to do and where to go in the event a fire breaks out.